I just dropped a 383 stroker with FITECH fuel injection in an old square body Suburban.....hello torque. Too bad the marine version is 3X the money. I think you're heading in the right direction for what you want to do. If this was my build, I would do the 496. Starting from scratch, it doesn't cost anything more for the extra cubes, and that American Turbine AA will like the torque. Do the short block with a 4.310" bore (.060" over), 4.250" stroke for the 496 (internally balanced). 6.385" con rod length, 4032 forged flat tops (which typically use a 3cc valve relief cut in the face) with a 1.270" compression distance. Zero-deck the block (should be 9.780") and cut the tops of the cylinder walls to deshroud the intake valves. The cylinder heads I would go with would be the GMPP 19331425 aluminums. Built by Edelbrock for GM from their Performer 454-O casting with a 110cc chamber but with a larger 2.250" intake valve instead of the standard 2.190" valve on the Performers (why Edelbrock didn't do that across the board on these heads I'll never figure out....) and at less than $2100 for the pair complete, some of the cheapest quality heads available. Flat-mill the heads for 100cc chambers and you'll end up with a 10:1 static compression ratio, which will run fine with 87 octane because of the flat tops and the chamber design of the heads (along with the heat dissipation of the aluminum) and raw-water cooling in the boat. I would use the Victor Jr. Oval port. The RPM dual-plane will put the torque curve in a lower rpm range than what you want for this application and won't have quite enough flow to properly feed a 496 at higher rpms. Professional Products Hurricane oval-port single-plane is also a good intake to use, and usually quite a bit cheaper..... With either intake, I would port-match to the intake ports with a slight mismatch on the outer port wall and floor of the manifold ports (just a touch smaller than the walls and floors on the heads to create a small step) to keep the air/fuel mixture in suspension, but not necessary, Just something I do on my builds for that "last little bit". Just make sure that there's no step in the ports from the head ports from the intake side to impede intake flow (I've seen this happen so I check every one of my builds for port alignment, even if I don't do any porting). I would also regard an 850 carb to be bare minimum for this engine. Something in the 950 range would be better. Either vacuum or mechanical secondaries would be fine (and you will be spending time fine-tuning it, which is normal). and do Vizard's COSCAM program to get the right cam for the job. Call him and tell him that it's for a marine application with wet headers and he should be able to set you up. This should get you 600+ hp and 600+ ft/lbs in the RPM range you want in a strong, long-lasting combo for that badass boat you're building!! If you have any questions Denon, just give me a yell! I will try to incorporate my engine build into this thread. It is a Mopar 400 block with a stroker kit to bring it out to 470 ci. In street form, this engine built by someone else, has made up to 775 hp, and over 600 ft pounds of torque. This is spinning it to 7500 rpm, and the high torque hits about 4400 rpm. I plan to tame it down a bit to live in a boat. I do have a couple questions that hopefully can get an answer. I see parts such as distributors and carbs being marine compliant. As we all know, the 400 was never a marine engine, although the 440 does share some parts with it. I am planning on running a fuel injection system, and have located a “kit” that makes the engine distributor-less. By using these parts, would I be violating the federal stance on marine equipment? I assume these parts would be less likely to have an errant spark? Good to know that my thoughts were correct! I guess I am lucky in that the marine 440 most likely uses the same starter. One of these days I’ll find one to pull parts from. A quick update / set of questions on my build (see earlier in thread - please let me know if I'm high jacking / taking over and I'll start a new dedicated one for my build). I haven't made much progress other than research and building a parts list, as I can't access the boat in the winter without snowmobiling there...and at that point I'm too busy snowmobiling! 1) What's everyone's thoughts on starting from scratch vs. rebuilding / upgrading an old 454 off ebay / kijiji? I'd like to be as frugal as possible, but by the time I've put in a new everything...buying used doesn't seem like it will save much. 2) In terms of exhaust I agree the basset water *injected* headers look a lot nicer - both functionally (long primaries) and aesthetically (shiny chrome) - and they're half the price. But I am *petrified* of both reversion, and of overly hot exhaust in a wood boat. Are my fears justified or needless? Has anyone else run water injected (as opposed to jacketed) headers in a Glen-L boat with good success? Would grabbing a long block from a junkyard be cheaper than shipping and the bidding wars on ebay? In regards to doing new or used on the block, even if everything else is new, there is actually a functional benefit to going with a used block in that a used block will have gone through multiple heating/cooling cycles to become a "seasoned" block. This will provide you with a more stable foundation when all the machining is done (in fact a lot of engine builders, myself included, will do a seasoned used block even if the cost after machine work is more than a new block for that very reason, but that normally isn't the case). The caveat to this is making sure the block you get is good and that the seller is willing to back it up if it doesn't check out. One option you might want to also look at is a 427 tall deck block that GM used in medium duty trucks and busses. Usually VERY well seasoned and usually cheaper than a 454 block, but they will all have 4-bolt mains and a beefier casting in the decks and cylinder walls, which adds a little weight but makes for one super tough block. They offer a very solid foundation and is actually what I'm using to build a 8-71-blown and E85-injected 496 for my brothers project. the only things that would change by using one of these would be rods, pushrods, timing chain set, the fuel pump pushrod if you're doing a mechanical pump, and the intake to suit because of the taller deck height. Everything else would be the same stuff and you can usually pick these up cheaper than the 454 block (the one we picked up was a virgin block with std. bores for 400.00 cleaned and ready for machine work). Note: make sure that the block has 4.250" bores if you go this route! GM also did a 366cid "big block" that externally looks exactly the same, but the bores are tiny and they normally can't be cut to the size you'll want. Good to have you back Denon!! @Matt, that's more what I meant - looking for some good junkyards in my area but most seem to be "full serve", i.e. I tell them what I'm looking for and they go find it. Makes it harder to scope out exactly what you need, i.e. a mark 4 / gen 6 4-bolt main in good condition! In terms of grabbing a full long block (or even a short block), I'm pretty sure I'll need to grab a new rotating assembly anyways, and definitely new heads since aluminium ones are pretty rare "stock" - so unless I stumble upon a massively lucky find that happens to have the right rotating assembly, I'm probably stuck with buying most of the parts new other than the block. @Dave I agree with you on getting a seasoned block, now that I've done a bit more research and taken your advice into account. I'm leary of the 427 tall decks just because of parts availability but I'll keep that in mind as well. I'm thinking I might stick to 30 over for now as well to keep one more "re bore" in the life of the block for later on when I need it, so I'll likely be going for a 489 for now. I'm DEFINITELY not closing up the engine compartment, but because of the rounded coaming of the rampage the pipes get *close* to the brightwork (almost touching), and my paranoia is making it hard for me to buy into water injection. Yes it looks better, and the wallet is *begging* for the savings they offer, but I'm worried that without a steady stream of water to cool things even at idle I'll run a risk of hurting the wood work I've spent so many years trying to perfect. I know I'm likely being naive but every time I do a bit more research on the matter to try and convince myself it will be fine, I end up doing the exact opposite! Anyways, at this point I'm hammering kijiji for blocks / shortblocks / parts engines at the right price to see if anything sticks, and might start touring the junkyards close by in the next few weeks. There's no major rush as I still have a decent amount to finish on the hull - deck varnish, seats, controls, etc etc - but I'll feel a lot better once I know this is in progress as well, and might even get to launch this summer if I'm lucky. Thanks everyone as always for your help, and apologies again that I disappeared for so long right after coming back! After some back and forth with both Dave and Paul, and seeing this pop up on Kijiji (and a crazy back and forth over nearly two weeks in the best way possible), I ended up picking it/her up this Friday. In short, this will get me on the water and running right now - it was run and winterized by a local marina I know and trust in the fall, and when they did a compression and leakdown test on it the numbers came back literally flawless. Nevermind that for $4k it came with literally everything needed to run (except, ironically, the starter) and a box full of spare parts, mostly ignition and hose related (see below story for where they came from). That's *well* below my budget for a motor that almost meets spec "out of the box", and will be a fantastic platform to upgrade down the road. Plus, the valve covers are *gorgeous* - part of me bought the motor just to get those valve covers! In terms of the tech details, it's not *quite* the build I planned out, but still a very solid performer stock - and a great place to start if I want to add more power later. After doing a phenomenal amount of research online, 454 Mercs generally fall into one of two categories - the regular, and the magnums. Magnums are harder to find, especially with a carb, but they have all the goodies and were/are a fantastic performance motor: 4 bolt mains, forged everything, quality components, great heads, good intake, and a decent / carb / cam. Because the lower end ticks all the boxes, the engine can easily handle 500+ hp - I just need to swap the cam for something a bit more aggressive, and maybe upgrade the intake and carb (it's got ~400 at the crank in stock trim / stock exhaust, which should still be plenty to get my rampage moving with zero effort). I'm considering tossing in a cam before I even get the boat in the water, as an intake and carb are easy to bolt on with the engine installed, and I'll have all winter to put a carb in. In terms of this motor's history, it started life in a reggie fountain race boat, before moving into - and this is the really cool part - the boat from Miami Vice. 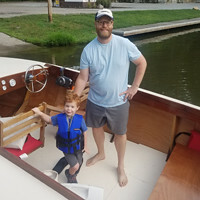 The current owner isn't sure if the specific hull is the *exact* boat from the show, but it's spec'd identically to the Chris Craft Singer 390X from season 1 of the show. Please do let me know if I should start another "dedicated" thread as I feel like I'm taking this one over, and would be happy to fork off my work into a separate thread so that this one can remain a collection of everyone's builds. Either way I'll be sure to keep everyone informed! Cheers, and happy belated Canada Day to my fellow northerners! I hear ya on the valve covers, I've bought more than one flathead ford motor due to the aluminum heads. Mr Hot Rod wrote: Post any inboard engine builds in this thread. These can be magazine article builds, or your own documented engine build. Well I just received my crankshaft that I sent to Birmingham AL had it stroked 3/8". Would that be a stroked V12 Jaguar??? Spot on Kens I want to get peak torque down by 1000 rpm with an increase of hp down lower so it all works better with a 12'' prop.